We can say that the plot of the Ring is simply this: Western man, in the person of Wotan, finally awakens to the destructiveness of his thumotic nature, and wills his own end. (See my review  of Duchesne’s Uniqueness of Western Civilization for a discussion of how Western man is preeminently thumotic man.) This comes initially in the form of agape, the negation of thumos. Wotan allows himself and the rule of thumos to be displaced by the hopeful, new world ruled by agape. But, alas, it is not to be. 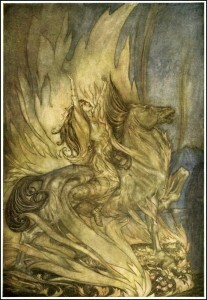 Thumos, in its degenerate forms, re-emerges and destroys the love of Siegfried and Brünnhilde. What is this wisdom that Brünnhilde has acquired, this knowledge of all things? (Note how Wagner emphasizes four times that she now knows all.) Wagner actually wrote two other versions of Brünnhilde’s final speech. The first, the earliest version (from 1852), is referred to by scholars as the “Feuerbach ending,” because it so clearly shows the influence of the philosopher, and reflects Wagner’s idea for the meaning of the Ring, prior to his reconceiving it. In it, Brünnhilde says that she leaves behind her “a world without rulers.” (In the final version, of course, she destroys the world!) And she says that she bequeaths to the world not wealth, not gold, not splendor, not “smooth-tongued custom’s stern decree” but instead “love” alone. the enlightened woman now goes. do you know how I attained it? I saw the world end. Ultimately, Wagner rejected this too – but for different reasons, I believe. While Wagner clearly did change his mind about the “Feuerbach ending,” and came to feel that it was not what he wanted to convey, I don’t think this is the case with the “Schopenhauer ending.” I think that it expresses pretty much exactly what he had come to believe was the “message” of the Ring. Perhaps he rejected it because it was too explicitly philosophical – too Buddhist, really. And so he went with the somewhat more ambiguous speech now familiar to us. But in both cases, the underlying ideas are the same. The wisdom Brünnhilde has gained – her knowledge of all things – is the realization that this world really is a veil of maya, and that the only appropriate standpoint is that of renunciation. I have already discussed how there is a theory of history – of “ages” – within the Ring. The shift from Wagner’s early, anarchist conception to his later “Schopenhauerean” conception is marked by a shift in his understanding of time. In true socialist fashion, the earlier Wagner saw time, or history, as linear and progressing towards a new world without masters, ruled only by love. The Wagner of the mature Ring, however, sees time as cyclical. At the end of Götterdämmerung, as the entire world is consumed by fire and flood, we hear the familiar strains of the “Rhine music” from the beginning of Das Rheingold. What this suggests, as many have pointed out, is that the end returns to the beginning: after the cataclysm, the world will be renewed; things will happen all over again in an “eternal recurrence of the same.” (The Ring is a ring, in other words.) A cyclical view of time, of cycles of ages repeating over and over again, is suggested here. Wagner’s “Schopenhauerean” standpoint sounds awfully grim. But just listen to the “Rhine music” that closes Götterdämmerung – again, reminding us of the beginning of Das Rheingold. It is bright and hopeful. “Renunciation” need not be an angry rejection of the world. It need not require us to become hermits – and it certainly does not require us to kill ourselves (in a famous essay, Schopenhauer opposed suicide). What it involves is recognizing that the world, or life, is suffering. And suffering, as the Buddha taught, is caused by desire. We think that the satisfaction of certain desires will make us happy, but in fact we only become ensnared in desiring more. There is therefore no true satisfaction in the satisfaction of desire – this is just a trap, in fact. The first step toward true satisfaction consists in recognizing this. The next step is not to eliminate our desires, for that is impossible, but to change our relationship to our desires. We learn not to identify with our desires and to become largely indifferent to whether or not they are satisfied. But this perspective is impossible without coming to see the world for what it is: as a never-ending cycle of suffering, followed by satisfaction, followed by suffering – which will never change. This is what Brünnhilde comes to see. This is why she repeatedly tells us that she now knows alles. And she brings the world to an end – symbolically conveying a state of complete and total detachment from the travails of life. But again, the tone at the end of the Ring is bright and filled with promise. The lesson we are meant to take away is indeed that we must detach ourselves from the world – that we must die to it, in a sense – but that we may live in the world at the same time, in a transformed and enlightened state. (Wagner wrote to a correspondent that the Ring “teaches us that we must learn to die”) Joseph Campbell liked to call this standpoint “Joyful participation in the sorrows of the world.” And this is clearly the approach to life that Wagner himself came to adopt. Wagner’s incorporation of this (optimistic) Schopenhauerean standpoint into the Ring is, of course, another chapter in the story of his engagement with the Germanic tradition. Though I have referred to Buddhism in explaining these ideas, in fact Schopenhauer claimed that he arrived at all of his basic theories prior to his encounter with Eastern thought. And, indeed, there is a tradition of what we might call “Germanic Buddhism,” going back to the medieval German mystics. Meister Eckhart, as well as the anonymous author of the fourteenth-century Theologia Germanica, both refer to a concept called Gelassenheit. This is very hard to translate, but it might be rendered literally as “allowingness” or “leavingness.” (Gelassenheit is a noun formed from the past participle of the verb lassen, which mean “to leave, let, or allow.”) The term shows up in Heidegger’s work as well, and has been translated into English (very imperfectly) as “letting beings be.” Gelassenheit is essentially the same attitude of detachment or renunciation taught by the Buddha and by Schopenhauer: living in the world, while remaining unaffected by it – letting things be, without identification. Of course, as Julius Evola taught us, there is another dimension to this standpoint, which gets lost when it is misrepresented as being all about peace and love and nonviolence. Indeed, the path of “joyful participation in the sorrows of the world” is the path of the warrior. And it is only possible through a kind of internalization of thumos. To follow this path one must master one’s desires, or one’s attachment to desire. Instead of an enemy “out there” that I seek to subdue, the enemy is internal: it is my attachment to ephemera, my bad habits, my restless mind that gives me no peace. I must conquer these things. Only then can I be free. One can thus see that the standpoint of Brünnhilde at the climax of the Ring is actually a further transformation, or “sublimation,” of thumos. She is only able to light the pyre because she has broken her attachment to the world – the supreme act of self-mastery; the supremely free act. And we find this same warrior spirit in the North, in our own Germanic tradition, expressed vividly in the Eddas and Sagas – in all the sources that took possession of Wagner when he planned and composed the Ring. One wishes that Wagner had explicitly realized that Brünnhilde’s “path of renunciation” is also the path of the warrior, but clearly he did not. (Too bad Evola wasn’t around to advise him that the Buddha was Kshatriya.) And yet what we must conclude is that in the message of the Ring there is in fact no fundamental departure from the spirit of the pagan, Germanic tradition. Here we come full circle, back to the original intention of this very long essay, which was not just to place Wagner within the Germanic tradition (broadly construed), but to defend the Ring as a grand synthesis – and elaboration – of the Germanic mythological material. One wishes, again, that Wagner’s attitude toward thumos – in its higher forms – had been affirmative. And that he could have said “yes” to our Faustian Western nature, and celebrated our desire for knowledge and mastery. It would be left to Wagner’s erstwhile friend Friedrich Nietzsche to do all of that. And clearly Nietzsche’s own affirmation of “will to power” was born of the same frustration with the Ring that we feel. It says so much, including much that is right, but ultimately we cannot make it say exactly what we really want it to. This need not trouble us, however, for the imperfections of the Ring pale in comparison to its sublime virtues. At the very least, Wagner can certainly be said to have succeeded in creating a modern equivalent of Greek tragedy. But it is crucial to note that it was Germanic myth, not Greek myth, that gave birth to this “total work of art” – which stands, in this author’s estimation at least, as the greatest artistic achievement of the modern era. The best way to approach Wagner for the first time is to listen – repeatedly – to just about any of the many CD compilations of “musical highlights” from his operas. There are innumerable discs that offer a “Compact Ring  ” or a “Ring Without Words  ,” and just about all of them are worth listening to. Then, when one has developed an affinity for Wagner’s music, one should attempt to either see live performances of his operas, or watch video recordings. Possibly the best opera to begin with is The Flying Dutchman  , as it happens to be one of the shortest. Tristan and Isolde  contains, in my view, Wagner’s most sublime music, and might also be a good first choice. As for video recordings of the Ring, the best available is from 1980: the controversial Patrice Chéreau  staged at Bayreuth. Also worth a look is the Metropolitan Opera’s production, staged by Otto Schenk  . (Avoid at all costs the Met’s recent, ghastly Robert Lepage production  – on video  or otherwise.) Though the Schenk production is far more “traditional,” the Chéreau production is superior in many ways – especially in its pacing. As for reading material, one could start with the libretti of the Ring. The best translation is by Stewart Spencer in Wagner’s Ring of the Nibelung  . The best books about Wagner are Deryck Cooke’s I Saw the World End: A Study of Wagner’s Ring  (which I made extensive use of in this essay), Bryan Magee’s The Tristan Chord: Wagner and Philosophy  (reviewed here ), and Magee’s Aspects of Wagner  (probably the book to begin with: it is quite short and offers a good overview of Wagner’s work and its meaning, reviewed here ). See Evola’s Doctrine of Awakening. See Julius Evola, “The Aryan Doctrine of Battle and Victory,” in Tyr 2 (Atlanta: Ultra, 203-2004).